The 290-year-old fort is stripped bare of its walls and Western gateway — a far cry from the citadel that boasted of six-metre high and 1.5-metre thick fortification in its heydays. Old structures are flanked by multi-storey buildings on either sides at Chiragh Delhi. NEW DELHI: What was once a thriving fort is now a sad picture of Delhi’s archaeological treasures crumbling under the pressure of an ever-growing population. 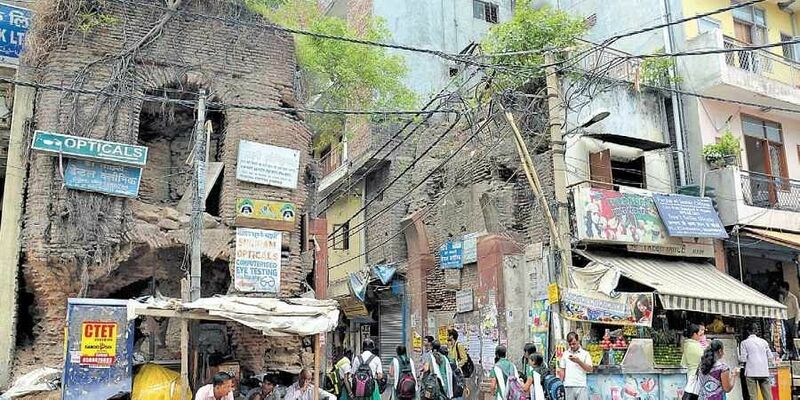 Built by Mughal emperor Muhammad Shah Rangila in 1728, Chiragh Dilli is now an urban village whose face is marred by dilapidated havelis struggling to stand before hideous buildings made of cement and concrete. The 290-year-old fort is stripped bare of its walls and Western gateway — a far cry from the citadel that boasted of six-metre high and 1.5-metre thick fortification in its heydays. The remaining three gateways, which were crumbling until recently, and old houses are the few traces of the glorious past. In a last-ditch effort to preserve the architectural heritage, the state archaeology department started out restoration of gateways in 2016 following the intervention of local legislator Saurabh Bhardwaj. The Indian National Trust for Art and Cultural Heritage (INTACH) was roped in for the project. While work on two entryways in east and south is over, reinstatement of the third entry in the north is likely to be finished in two months. The fort is primarily a rubble-masonry structure, and its doorways are made of Lakhori bricks (flat thin burnt clay bricks) and red sandstone. “The north Darwaza was worst affected and only one side of the structure existed. Efforts are being made to restore its chambers. The arch will also be recreated and structure-friendly lamps will be installed for its illumination. It will take about two months,” says Bhardwaj. Located on the converge of Lala Lajpat Rai Marg and Outer Ring Road, Chiragh Dilli village owes its name to the revered Sufi saint Nasiruddin Mahmud Chiragh Dehlavi, who was accorded the title of ‘Roshan-e-Chiragh Dilli’ means ‘illuminated lamps of Delhi’. “The fort at Chiragh Dilli was built in 1728 by Mohammad Shah Rangila. 220 square yards in size initially, it had four gates on its four sides and encircled the settlement,” as per a Gazetteer record on rural Delhi published in 1987. During an invasion of Afghan ruler Ahmad Shah Abdali in 1761, the people from adjoining villages took refuge in this fort. Wealthy villagers built havelis inside the four walls. As the population swelled gradually, the village spilled beyond the limit of the fort. “Initially only four havelis were built in the village. As the families grew, more rooms and structures were added to havelis. After they were saturated, several of them constructed multi-storey buildings,” recalls Son Devi, an elderly resident. Despite unplanned construction, remnants of jharokhas (overhanging enclosed balconies) can still be seen jutting out from buildings. According to folklore, the stream was used for bathing royal animals. Another legend says a tunnel was located inside the fort, which was connected to Tughlaqabad Fort.